Some of you may remember my post from a while back where I was considering buying a new body protector for cross country. Once I finally decided which one I wanted and what color I wanted, I was of course immediately unable to find the right size/color anywhere in the US. But I did notice that Riding Warehouse (my faves) carried the vest in black, so I figured I’d email and see if it was possible for them to special order it in navy, since they’ve done that for me before with other things. They answered me quickly with an “absolutely, we’d love to” (they’re so nice I always want to poke them to see if they’re real), they put the order in for me, and we proceeded to wait. Having had items backordered from other companies before, I am always skeptical about arrival times, especially when they’re coming from overseas. I tend to order it and then forget it. But the projected timeline they gave me ended up being spot on, and I got a notification once they knew when it was expected to hit. When they received it they immediately (for real, within a day) had it on a truck to me, and it arrived 3 days later. Did I mention they had the best price of anyone in the US? Did I mention shipping was free? I’m waiting to do a review/comparison post of the Airowear vs the Tipperary until I wear it a few times, but visually and structurally the difference is huge. I let SO play the “HIT ME” game with me wearing each vest and boy could I tell a difference. But more on that when my thoughts are more organized. Do y’all have input on what type of review you’d like to see? I can do pictures, as is typical, or I can do a video review like you see on a lot of tack shop websites. Maybe a mix of both? Anything in particular you really want to see about one or the other, or comparatively? If you have specific questions, get them to me and I’ll address them in the review. I also ordered a few more things from Riding Warehouse (because happy early birthday to me?) one of which is my long-coveted navy DSB boots. Once again they had the best price and free shipping. They’re pretty and I love them. I tried one more time to buy something from Smartpak a few weeks ago, mainly because they were one of the only shops left on the entire Internet that had still had a few of the now-discontinued shirt that I wanted. Once again the experience left me very very frustrated and required me getting pissed off before they offered to make it right. They resolved the situation and it ended satisfactorily, but I am officially done with them. I tried. I really tried. Riding Warehouse is just way better, and cheaper, and faster, and nicer, and has never once made me want to stab them in the eye. That’s saying something. I really wish Riding Warehouse had a better selection. They won’t apply discounts to special orders, and they might only carry one color of something that comes in 9 or 10 colors – like the brown one-k helmet or any of the other 20 colors of Kastel shirts. I know why they do it, but that’s why I end up buying from Dover, because I don’t just want white or black and if the price is the same, Dover is closer and will refund me anytime. They’ve let me use a discount on special order items before, but I had to ask when I called to pay. I find their prices are almost always better than Dover, plus they have free shipping, which Dover definitely does not have – Dover’s shipping is outrageous (unless they weasel you into getting their credit card, a tactic that irritates the hell out of me). They’ve always processed my orders on in-stock items the same day and I can reliably count on having the item in my hands 3 days later… all for free. Riding Warehouse also has free returns for an entire year – no driving to a store or paying for shipping if you need to send something back. All of that combined makes them really hard to beat, IMO. That’s interesting. When I special ordered the brown one-k they outright told me that I could not apply discounts to special orders. I do have the Dover credit card, but I also have a store 10 minutes from me that I order through if I don’t want to pay shipping. That’s funny, because I asked my local Dover about ordering something to be brought into the store and they told me they couldn’t do that, and I should just order online. LOL. I have a pretty serious hatred for that place anyway and don’t love a lot of the brands they carry, so I have to be pretty desperate to order from them. I also have a serious hatred for Dover because their customer service isn’t that great and their prices are always more expensive than RW or SmartPak. But I mostly hate Dover because their shipping rates are absolutely insane. I checked the price to ship 1 show shirt with regular, snail-mail, take-your-time shipping and it was going to be $13….for 1 lightweight, non-fragile show shirt. Who do you think you are, Dover? I used to love Smartpak for their same day shipping if ordered before 2pm EST. I don’t think that exists anymore and their shipping times seem to be getting slower and slower. It also drives me completely crazy when I order 3 items and they come in 2 separate shipments. Yup, that was exactly my problem. I love all the new navy stuff! I have only placed one order through Riding Warehouse, but I was very happy with the price and the fast shipping. Their selection is fairly small, but any time I can order from them I will. It’s good to know that they’ll order other colors of items that they do stock. I will not order from Dover unless absolutely necessary and will only sometimes order from Smartpak. I am so jealous of all the good online shopping you have down there. Those boots look really nice. Love the navy boots! I finally ordered the bright pink ones a month ago and I love them! I got them from Riding Warehouse too, they had the best regular price AND they were on sale when I bought them. I love RW! Thanks so much for telling me about their special ordering. The ordered me 2 Kastel shirts in colors they didn’t have on their site. I’m in Canada and even with shipping and duty they were cheaper than a Canadian tack store. Plus they are lovely to deal with. I only want to shop with them. I love Riding Warehouse. I was doing product reviews and reviewed a product I wasn’t happy with. They emailed me and contacted the manufacturer to see if there was a way to get a refund. I wasn’t even looking for one, so this was above and beyond. Those navy boots are just smashing. 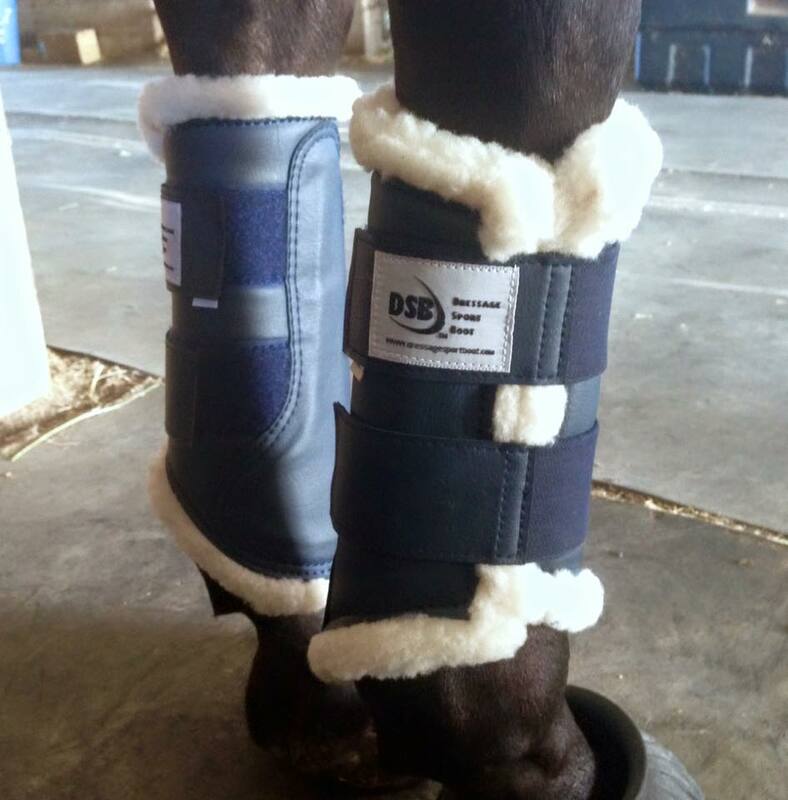 I will not buy new dressage boots. Just buy them. Use the 15% off code. Qualifies for free shipping. I mean really, they’re cheap and beautiful so why not. Looking forward to your review! I got the Charles Owen Kontakt5 vest which looks similar in design and price to the Airowear. I’m open to us doing a compare-and-contrast review posts if you like. Happy to ditch the old Tipperary! Yes, the Kontakt seemed pretty similar to the Outlyne when I was shopping. There were only a couple things that pushed me toward the Outlyne instead, but mostly fit related as opposed to safety features. I have a Rodney Powell that I absolutely love and while it’s bulkier than a Tipperary, it feels WAY safer and conforms to my body as it heats up. Better yet, it doesn’t touch the back of my saddle — it’s so hard to find vest without super long backs! I used the RW gift card on a bit that was back ordered and they were indeed super good with the communication and letting me know when it was going to arrive! Very happy! I’ve still never had a problem with Smartpak, but maybe that’s because I’m in the same state as them and standard shipping from them to me takes literally one day. It’s awesome. I actually have a friend that works for Dover and it seems that the fact that they don’t offer free shipping is a sore spot amongst many of the employees as well. The fact that they still don’t offer any sort of free shipping or even discounted shipping seems to be a bit of a … political desicion. It’s weird/ interesting. I’m pretty sure it’ll feel a little hotter/heavier, just not sure exactly how much yet. I’ll wear it a little next week and see! Sweet!! Customer service is so big!! I’ve only had great service from Smartpak, but a friend of mine in Mississippi was sooooo mad at them she posted on her personal FB page this week that she will no longer order from them. She detailed a bad experience and it was surprising. Too bad for them because she has her own barn with several horses and has to shop somewhere. definitely becoming a tried and true believer in Riding Warehouse, tho i’ve also had nothing but positive experiences with smartpak and dover, as well as my local independent retailers. 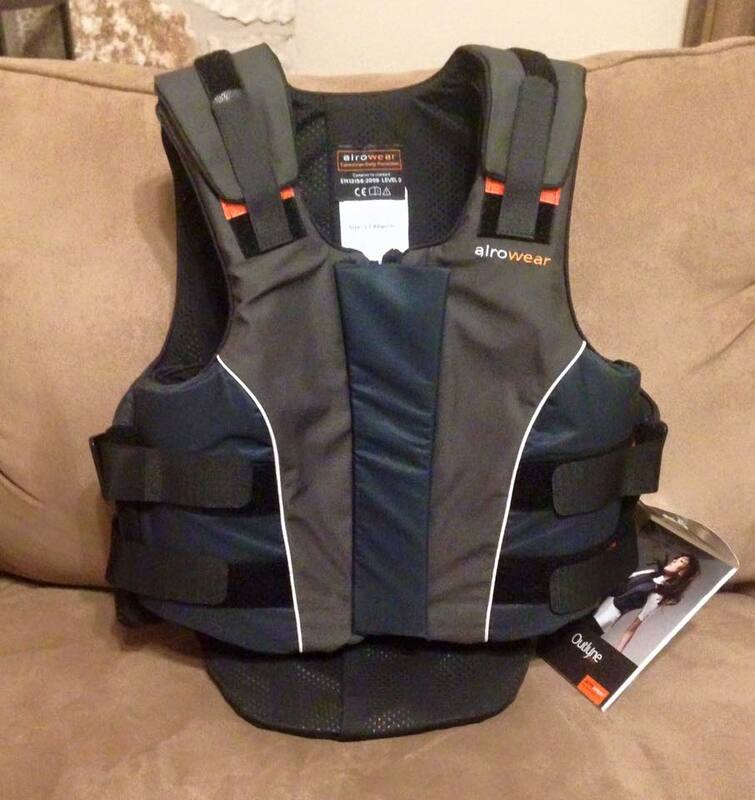 will be super curious to hear your thoughts on the vest too – hope you love it!